President Obama says he can lift 500,000 Americans out of poverty with just one move. Obama's proposal would lower the age childless workers are eligible for the credit, which is meant to encourage work, from 25 to 21 and increase their maximum benefit. Currently, the credit most helps low-income workers with children, by giving them a tax refund that in some cases can total several thousand dollars a year. For low-income workers without kids, or those that aren’t the custodial parent of their kids, the credit maxes out at about $500, and workers rarely end up claiming that much. 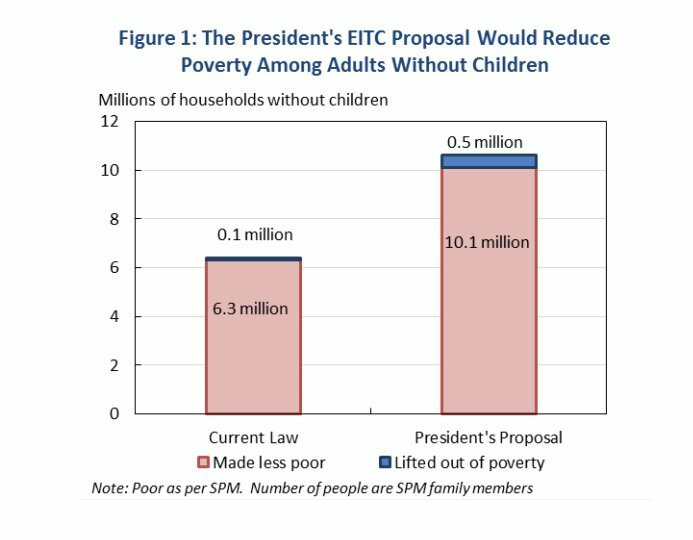 Expanding the EITC would help reduce poverty in two ways, according to Thomas Hungerford, a senior economist at the Economic Policy Institute, another left-leaning think tank. First, it would give childless low-income Americans who are already working an income boost. And expanding the credit would encourage more people to work. “It was designed to get people into the workforce because you can only get it if you have earned income,” Hungerford said. Many argue that this is one of the most direct ways to help low-income workers. In 2011, the credit lifted 6.6 million people above the poverty line, according to an IRS estimate cited by the Associated Press. 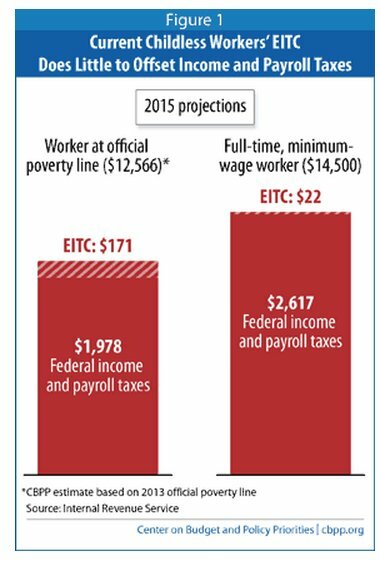 An EITC expansion only benefits the poor, unlike a minimum-wage hike, which could help some people who are not poor, like those working minimum-wage jobs for extra cash. Expanding the EITC is also more politically palatable than a minimum-wage hike, which many conservatives oppose, arguing it will discourage businesses from hiring minimum-wage workers. Still, raising the minimum wage to $10.10 an hour, as Obama and Senate Democrats have proposed, would lift 5 million Americans out of poverty, according to University of Massachusetts-Amherst economist Arindrajit Dube. Texas governor and Republican presidential candidate Rick Perry <a href="https://www.huffpost.com/entry/herman-cain-minimum-wage_n_1035157">criticized the commerce clause</a> for creating minimum wage laws in his book "Fed Up! Our Fight To America From Washington."